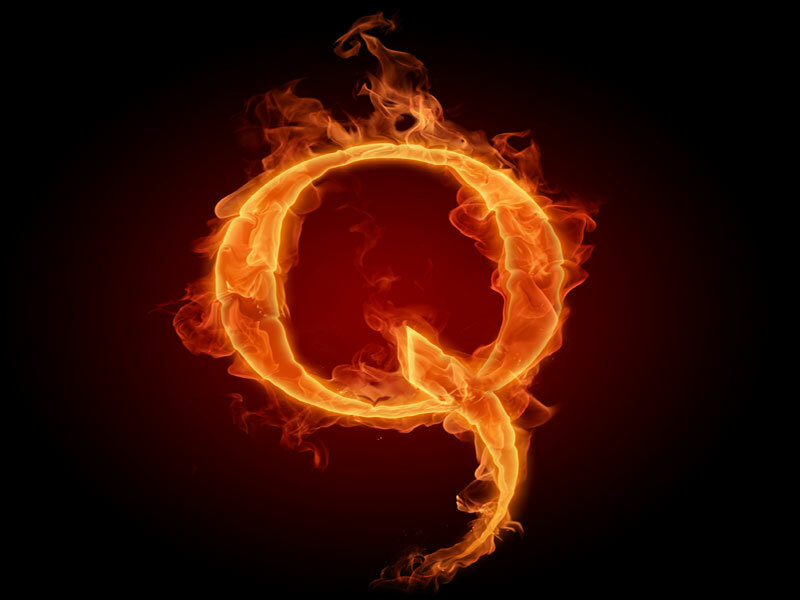 Note – this article will introduce the topic of Q-anon. But it is by no means exhaustive. The Q-anon phenomenon has become a hydra creature that is breaking the internet and influencing a lot of good folks into believing a huge deception about Donald Trump. Therefore, I must expose it, because it’s momentum is escalating and may potentially bring bloodshed and civil war to America. America – The mighty one has fallen. America – The experiment lasted 242 years. America – Oh how we weep for you! The present situation with Q-Anon involves Donald Trump at its very core. Trump is the nucleus, therefore, he must be included as a principal player in this matter. To leave him out would go against intellectual honesty. There was a time when Donald Trump was just a New York landlord and developer. But then he got older and became the President of the United States. Most people would have been satisfied with that, but not Donald, because while it might have been an achievement to be the president, Mr.Trump has outgrown the office, and has become larger than the presidency. – If he were a body of water, he would be an ocean. – If he were ship, he would be an aircraft carrier. – If he received tribute from those in other countries, people would name their streets and airports after him … Uhhh, correction, that’s happening in Israel! “Nathan, I thought this article was about Q-anon? It is my friend, and what I said above is related to the Q-anon End Game, because there is an end game to their madness, and Mr. Trump is a part of their plan. 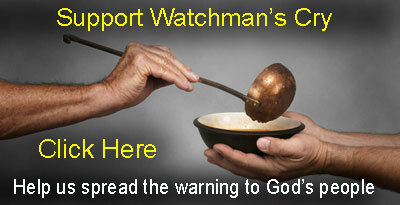 Whether he knows about it, is another matter, but should it come, he will be involved! By the way, this article is not about my preference for partisan politics. I am not partisan folks. I do not favor Hillary. That accusation is a dated misnomer. Both sides of the aisle are corrupt. I have never trusted the left, and fifteen years ago, I stopped trusting the right. The politicians on both sides are controlled opposition. They are liars and fakers who are more concerned with their retirement benefits than the well-being of Americans. Politicians are corrupt. This includes the White House. It’s all in the Bible. The book of Revelation tells us in chapter 13 that the serpent, AKA the red Dragon, will be given authority to deceive and overcome the residents of earth. And worse, he will be given authority to overcome the saints and wear them down. This means that in the end times, Christians will be in the line of fire and a great deception will cause some of them to pledge their loyalty to the beast government and its leaders. A long time ago, church folks were taught this in Sunday school. Today it’s happening. The great delusion is here and it’s wearing several cloaks that are not scary. Most of them look heroic and inviting, because after all, who would suspect a disguise that resembled a patriotic constitutionalist, or a cleric of the church? Friends, I can’t say this enough, if they have their way, it will get very, very ugly! The end game is approaching the finish line, and when it crosses, Hades is going to bust its chains, and ooze out of the ground. … uh oh … scratch that … That phase has already begun, so be sure to watch your step. Hell gets testy when you step on its tail. I know all about it. Every time I put one of these warnings out, the critters from the underworld start fluttering about like that elusive bat at a recent Trump rally. And speaking of … I remember I had a dream several years ago where I saw a giant orange bat creature fly over the country, and it had the face of Trump. …And now here we have an actual bat at a Trump Rally! 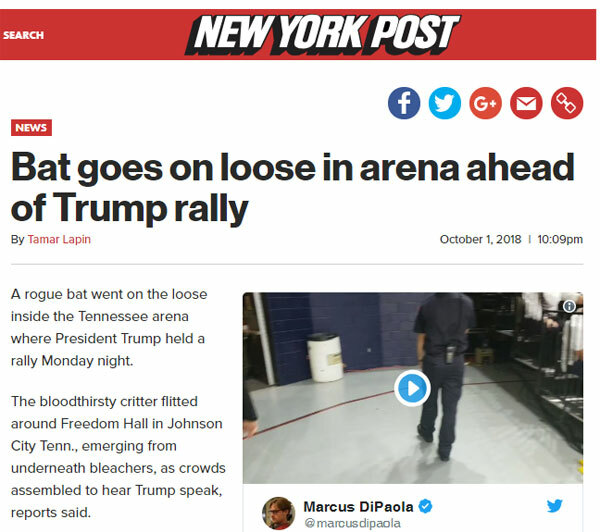 “A rogue bat went on the loose inside the Tennessee arena where President Trump held a rally Monday night. The affirmations from his father harmonized with Trump’s ego, because as an adult, this desire has been on display on several occasions. Over the past three decades, he has been working toward that goal. So what do we have so far? We have Trump, the fledgling monarch, and Q-anon, with a plan to make it happen. Ladies and gentlemen, Q-anon has become a dangerous specimen on the internet. Because it/they is/are gaining followers by the tens of thousands who believe the lies. And lately, the lies are becoming more and more absurd. Q-anon’s posts, also known as, breadcrumbs, have made a turn into insanity! They are now promoting fascism, and totalitarianism under a Donald Trump rule. Also disturbing, they are telling people that when it happens, citizens should, “trust the plan,” because the, “great awakening,” is coming. When a large portion of free citizens begin crying for totalitarianism, the quotient of history does not lie. When you divide a country, and steer them into chaos, cities will burn. Lenin’s Bolshevik Revolution is proof. He enlisted the “workers” of Russia into his coup, and demonized the ruling party to the point where his followers wanted their blood … and got it! …Unfortunately, it was their own blood that eventually watered the ground. Enter the USA …. THIS IS DEVELOPING NOW!!! If their plan materializes, America will become an ash heap. And get this, it will be at the hands of patriots who are being led by words of coercion found on their phones. Q-anon wants Americans to murder politicians, burn down their cities, and attack a few countries including, Syria and Iran. Again ladies and gentlemen, Q-anon is operating in lies, and a lot of unsuspecting Christians are believing it. The answer is simple, the operation’s purpose is to destroy America and turn it into a dictatorship. I know that right about now, a few folks are protesting my words. But it doesn’t matter how loud anyone protests, because the engineers of this operation really don’t care. Their mission is to destroy this country, and if it is successful, it is going to forever isolate the evangelicals and the patriots a catalyst, because they believed it, promoted it, and went along with it. Operation Q-anon is using a proven method to accomplish this – social media. It is the apparatus of the new millennium. It is powerful, and it is being used to brainwash the population with lies and recruit them as soldiers for their cause. It’s a tried and true way to overthrow a nation. America has been doing it for years. Are you familiar with the Arab Spring? The Green revolution? The Orange revolution? Those revolts were engineered and carried out by the CIA. These uprisings were the product of the US government. And now, America is the victim of a similar tactic. When America sponsors revolutions and coups in other countries, they use assets on the ground to recruit people. The recruitment process is funded by non-governmental organizations, NGOs, that are proxies of the CIA, the NSA, and other men in black. The US has mastered this technique. Unfortunately, other countries of the world are aware of these tactics, including Russia, who has also sponsored coups as well. Does this mean Russia is behind Q-anon? Maybe. Maybe not. Ladies and gentlemen, the purpose of this warning is not to solve the riddle of Q-anon’s identity, but rather to warn everyone that they are a deceptive lie! Q-anon is an operation of delusion. They are leaving breadcrumbs to purposely deceive and maim the intelligence of people who should know better. I always expected that Babylon America would morph into a dictatorship. But I never expected that it would happen under the cheers of constitutionalists and patriots wearing red baseball caps. Make note ladies and gentlemen, the feral cat exited the bag. It’s here! It can no longer be denied. It is evangelicals, constitutionalists, patriots, and right wing citizens who want Donald Trump to impose martial law in America and start rounding people up. … And thus, become the first dictator of America! The fireman prophet Mark Taylor has been at work brainwashing a portion of the assembly with this proposal, and now over the last few days, a prominent voice in the alternative right, Mr. Mike Adams, the Health Ranger, put out a YouTube that echoed Q-anon, and voiced the necessity for Trump to hijack the US government, and roundup any and all of his enemies. By now, most of you may know about it. When I first saw it, I found myself bewildered, disturbed, and then annoyed that Mike Adams would do such a thing. First Mark Taylor, and now Mike Adams? Because after all, Adams is supposed to be a patriot who respects the Constitution. So what gives? Because in my humble opinion, what Adam’s said is – absurd, preposterous, insane, and if I left anything out ….that to! Brethren of the faith, to openly propose that a sitting president should unilaterally bypass the Constitution, become a dictator, and round up political enemies is incredibly foolish. How can patriots support this? Over the last year, a lot of patriots got mad when NFL players took a knee during the national anthem. … and then declare martial law so that he can round up his enemies. And evangelicals are okay with this? Have patriots and evangelicals gone into a coma? This is insanity folks. And one of the driving forces of this is Q-anon. 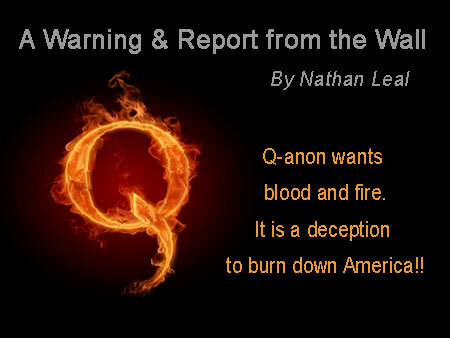 Q-anon is promoting this madness … This insanity… This absurdity! And the Health Ranger is promoting it also. But now, a portion of those same people are for this? Folks, there is so much that will go wrong if something like this is imposed by Trump, because should he get this sort of power, he is not going to abandon it. … and order a tailored suit like the Führer und Reichskanzler. No my friend, Operation Q-anon is crazy, and so are the words of Mike Adams, and Mark Taylor because they go against the American Constitution, which is the only thing restraining Mr. Trump at the moment. But should it be removed, my warnings of the past two years will be displayed in real-time.